STOP PRESS: La Piratita shut down earlier in 2013 and Cafe Tacuba also closed its doors. Good news: La Piratita has now opened up in a new locale, in the Restaurant Luzernerring, on the corner of Hegenheimerstrasse. All details in Eating Out Alsace, Basel and Baden. 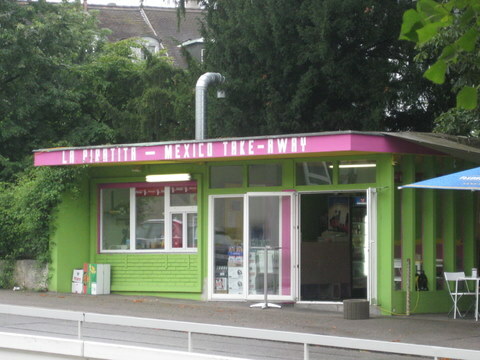 Mexican restaurants in Basel are like the Number Nine Bus: you wait for ages for one, then suddenly along come two in quick succession. First we had Cafe Tacuba; now we’ve got La Piratita. It’s a great little shack of a place close to the Kinderspital, just about where the road from the Johanniterbrücke plunges down into the jaws of the hospital car park. There are a couple of tables inside the shack, with room for a few more outside, sheltering (at the moment, given the grooooosig weather we’re having) under a pretty effective tarp. You can also do takeaway/takeout. It’s the brainchild of Berenice Amstutz, born in Guaymas (up in the troubled north in Sonora – tho’ Berenice says it’s tranquilo up there on the coast), now resident in Basel, and her Swiss-Mexican husband. Their aim was to reproduce a real taqueria like in the DF: wooden tables and benches, plastic plates, paper napkins in a dispenser, hot sauces (red and green) on the tables, beers (loads of choice including Negra Modelo) in the fridge, a single plato del dia and warm tortillas to wrap it all up in. Last Sunday barbacoa was on the menu. In Mexico this is a typical Sunday dish, and it comes in various guises depending on the region. Sometimes it’s made with lamb (or mutton), sometimes pork. The word barbacoa suggests grilling, but in Mexico it means pit barbecuing (like a méchoui in France or the Maghreb). The meat, anointed with a fiery chile-based paste, is wrapped in maguey or banana leaves and baked in the pit over a wood fire for hours till it collapses in a mess of deliciousness. 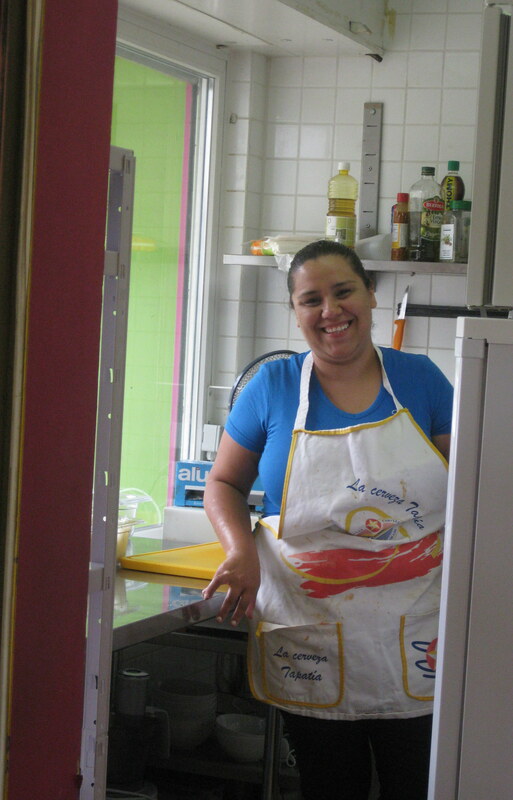 Home cooks and anyone without access to a pit (like Berenice) take a simpler approach. Berenice’s barbacoa is made from slow-cooked beef – she uses a braising cut called Rindsragout, the kind of cut you’d choose for a boeuf bourguignon – cooks it for hours in a not too spicy red chile sauce, then chops it finely. In deference to local palates it’s not hot, so chileheads will want to apply liberal doses of the red table sauce (now that IS hot – chile de arbol?). The meat comes to the table heaped up on a pair of warm corn tortillas. You divide the mixture evenly between the two tortillas, roll ’em up and eat without ceremony. Sauce dribbles down your chin, Negra Modelo slips down your throat and the No. 36 bus roars by at regular intervals. Shut your eyes and you could almost be in the Calzada de Tlalpan. Sunday 1 – 6 p.m. Between my parents living in Mexico and me living most of the past 10 years in San Diego, I’ve been going through some serious Mexican food withdrawals since moving to Basel. I’ve biked past this quaint green La Piratita many times but it’s always closed. Each time I think, “Mmmm…this reminds me of some of my favorite little taco shops in San Diego. I HAVE to go here sometime soon.” But then I forget until the next time I stumble by it. So my thanks go out to you for providing the back story on this cute place and for sharing the hours. Perhaps we’ll head over there this Sunday! Hi Jason – isn’t it great how word gets around when there’s some good Mexican in town! I heard about it thanks to a Mexican resident of Basel, who was homesick for the real thing. Check Berenice Amstutz (chef)’s facebook page, http://www.facebook.com/LA.PIRATITA.MEXICO.TAKE.AWAY to be sure they’re open on the day you want to go, and for the day’s special, regularly updated. So nice to read on a Piratita in your Blog! ut as she says, do add la piratita on you facebook for daily updates. hey karina – was a bit worried to hear that they may only be able to do takeout now – do you have any updates? See you there again soon! Did you know that they now have a full fledged restaurant? It’s in the “Restaurant Luzernerring” building, and it still says “Luzernerring” but actually it’s “La Piratita” … very, very good food! Hi Pat – yes, went there the other night and it’s just as good as ever. Love, love her autentico Mexican food! I’d updated her entry on my Eating Out Alsace Basel Baden page, but forgot about updating this one – thanks for flagging it up!